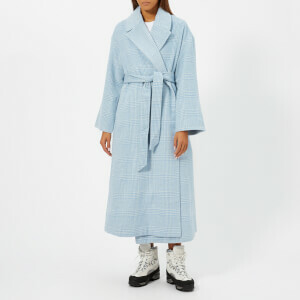 Single-breasted houndstooth check jacket with a cocoon silhouette from Parisian fashion label Maison Margiela’s diffusion line. Expertly woven in Italy from a wool blend, the oversized coat fastens at the front with three exaggerated buttons through the front and features a collar with notched lapels, long batwing sleeves and slanted welt pockets at the sides. A vented rear hem and built-in lining completes the design. Main: 50% Wool, 50% Polyester. Lining: 100% Viscose.